I can’t tell you how overwhelmingly excited this makes me. 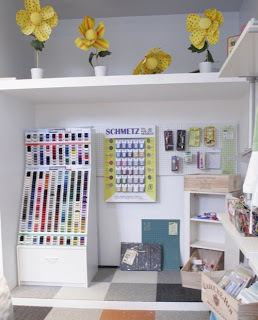 In my wildest dreams–my driving-down-the-interstate-reading-the-lotto-billboard-and-fantasizing-what-I’d-do-with-that-money dreams–I can only have ever hoped that I’d have a little fabric shop all my own. And here it is! Sooner than I’d hoped, and not at all like I’d expected. And isn’t that totally the way all the best stuff comes about?? When I started designing children’s clothing three years ago, I didn’t really know where it would take me. Somewhere deep inside, I sensed that it wasn’t design that my life held for me. When I began teaching sewing classes in Atlanta a year later, it was as though I had a flashlight that gave me an inkling of where I was headed. 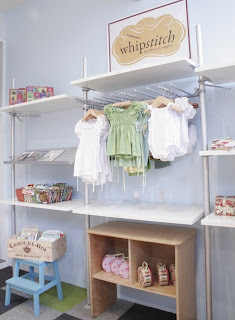 When the idea for this shop came about right on the heels of opening my Etsy fabric shop, that’s when the light really went on and I felt like I’d found work I can love forever and ever. Like, no more Mondays kinda work. Like, I LIVE my work (a la Martha) and would do this for free. The space we’ve moved into is in addition to the Etsy shop, and is in a lot of ways an extension of it. 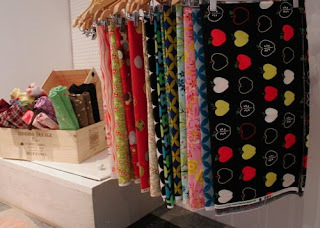 It’s an idea that hasn’t really been tried before: since the shop is inside Beehive Co-op, a very cool designers’ co-op in Atlanta, we don’t have a full-time fabric cutter. 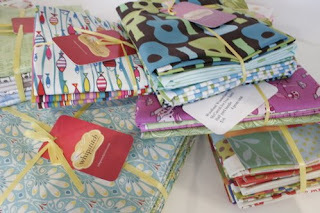 The fabrics are by the yard, half yard, and fat quarter, and in bundles of the same cuts. Y’know, like an Esty shop but in real life. Need more than a yard? 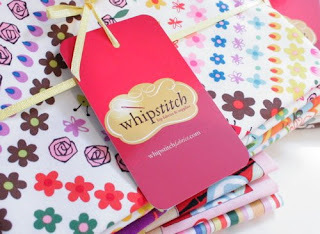 Call in a special request–pick up in 24 hours at the shop, or have it shipped! 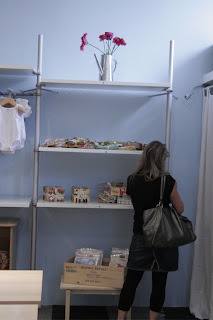 Our sewing classes are going full-force, too, and this amazing light-filled space gives me lots of room to host folks looking for community or advice or just a place to sew. Thread! Notions! Supplies! And all IN-TOWN! For those of you not in Atlanta, you cannot possibly know how big a deal that is–the box stores, of which there are exactly TWO inside the city, do NOT want you there; and the other box store is 19 miles away, no joke. The whole idea of getting thread this close to the city center, well, let’s just say I feel funny inside when I think about it. 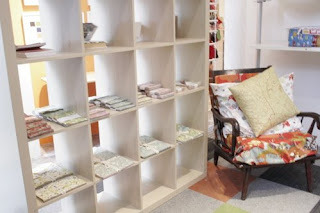 We have a comfy chair surrounded by the most beautiful fabrics, so come sit a spell! 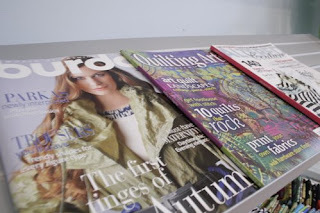 Read a magazine, get inspired! Find the perfect patterns for the perfect fabric for the perfect project you’ve been putting off. 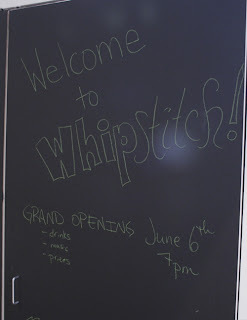 Take a turn decorating our chalkboard, and be sure to mark your calendars for the Grand Opening on June 6th, catered by Mint Julep (you’ll DIE when you taste the mushroom pinwheels–WOW!). 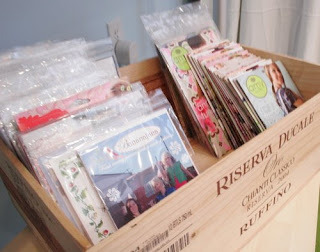 Can’t wait to see each and every one of you in the shop (directions here). Geography is no excuse! ← Heather Ross’ Far Far Away Collection for Kokka: IT’S BACK! CONGRATULATIONS!! I can only imagine that working with you in person will only be better than over teh internet. Best of luck—although I don’t think you need it!! Congrats, D! So happy to see all of this coming together for you. It is all so beautiful and well put together. I just want to sit in there (without my children) right now! CONGRATS! I hope it goes well! btw, my verification word is “chinimen”. Um, you been putting your chinimen to work lately to get the shop open…? Oh Yah! I am soooo coming to your shop. I should probably bring a big wad of cash too…now if I could only remember where I put it. Wow, this sounds amazing. I wish I lived close to ATL! Wish I could have met you at Market! Glad to meet you in blogland, though. I love your shop! Oh wow, it is so beautiful! If I wasn’t 5 hours away in FL–I’d definitely come to the Grand Opening. 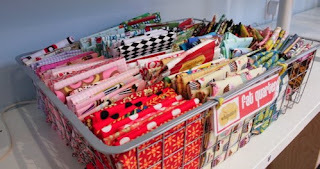 I thought it was only out in the country that you had to drive to find fabric/thread/notions/someone nice to help you!